Patient safety issues were again prominent in the Exhibit Hall at the 1998 Annual Meeting of the American Society of Anesthesiologists held in Orlando in October. Among the Scientific Exhibits, there was one organizational exhibit with potentially under-appreciated patient safety implications. The Association of Anesthesia Program Directors (AAPD) had a booth concerning substance abuse problems among anesthesia clinicians at which its piercingly poignant video “Wearing Masks” was shown on a continuous tape loop. This video presents insightful information from a recovering anesthe-siologist and, particularly, about an anesthesiology resident who became addicted and then died from an accidental overdose of sufentanyl in a hospital anesthesia call room. While there are no specific data about the patient safety impact (dangers) of impaired anesthesia clinicians, the implications are clear and also sobering. The AAPD has copies of the video available for a cost of $5.00 [information can be obtained by faxing AAPD at (847) 825-1692 or e-mail to “r.bruns@ASAhq.org“]. As has been the case in recent years, a great many scientific exhibits featured computerized presentations or demonstrations of new computer tools for support of anesthesia activities. One example was a “virtual pharmacopeia” in which a huge amount of medication information was instantly available in the OR setting via a LAN and browser with the goal of encouraging safe, correct, and thoughtful use and understanding of medications for patients receiving anesthesia care. Another remarkable exhibit featured a virtual reality simulator for practicing regional anesthesia blocks that includes “tactile feedback” with which the student or practitioner not only sees on the computer screen where the block needle is going but actually senses changes in “feel” of the needle as it is inserted into the model. The safety implications of significantly improved teaching of block techniques are obvious. One scientific exhibit featured diagnostic imaging films showing various spinal lesions and offered anyone interested the opportunity to inspect 10 films with a total of 20 spine problems and submit a list of findings for grading (on which heuristic feedback was provided at the booth). A comprehensive presentation of the multiple implications of latex allergy for both patients and caregivers attracted significant attention. Another exhibit addressed intraoperative “silent bronchospasm” and its diagnosis using capnography, suggesting that this is an occurrence much more frequently than previously understood. An algorithm for response to a low-pressure alarm during intraoperative ventilation was presented in detail. As has been the case before, airway issues and airway tools constituted the largest group of scientific exhibits with clear patient safety implications. 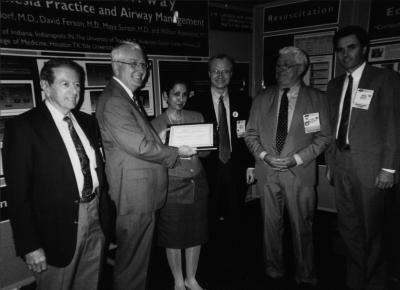 A remarkably thorough display of the history, use, and safety value of laryngeal mask airways won the APSF award for the best safety-related exhibit (see photo). Improvements in a fiberoptic laryngoscope which has high intensity illumination from a compact source and a small LCD screen that clamps to an IV pole were demonstrated. Another intubating laryngoscope system, this one from Switzerland, was displayed. In this one, the operator sees on the screen what the tip of the laryngoscope “sees” and the endotracheal tube is advanced under direct vision from above the larynx. While the Technical Exhibits featured several rides and videogames (it was Orlando, after all), the theme of airway tools also was again very prominent. In addition to variations on the classic tools, there were several new fiberoptic systems, including a short endotracheal scope used functionally as a tube stylette with full fiberoptic capacity (the screen was small and easily positioned in the anesthesia workspace) and articulation; the process resulting has the characteristics of a standard direct laryngoscopy and intubation but with a view out the end of the ET tube as it advances. Parallel to this was the display of what was offered as the first endotracheal tube with fiberoptics actually in its wall. The image can be seen on a traditional screen or on the inside of glasses worn to create a “heads-up” display. The disposable fiberoptic endotracheal tubes are slated to retail for $195 each. Another new device resembled a traditional large oral airway, but is a guide which holds a regular ET tube into which a regular fiberoptic scope is inserted. The guide is positioned so that the image shows the cords and the tube is then advanced into the trachea. Yet another variation was a different “imaging stylette” that has a light source and video screen in a box that clamps to an IV pole (a prototype of this device won the APSF safety exhibit award in 1997). Many other types of products with potential safety implications again were shown in new formats or designs but with technology now becoming traditional. The abundance of patient warming devices and anesthesia/OR information management systems are good examples (the latter of which had a widespread “beware of Y2K” spin this year. “Latex-free” was a prominent claim for a great many types of equipment and supplies as was the now more and more familiar “MRI-compatible” label. Real-time or “in-line” measurement of arterial blood gasses was again featured. One new entry utilizes an IV pump-like system that aspirates blood from the arterial catheter, analyzes it using miniature traditional electrodes, and then reinfuses it into the artery. New technology was displayed that, it is claimed, will virtually eliminate motion artifact from pulse oximeter probes on awake patients. A relatively “low-tech” but still clever device was shown for the first time. A simple squeeze-bulb device is being marketed as both a valve-checker for anesthesia machine breathing circuits (eliminating the need for the clinician to breath through a circuit to test the integrity of the one-way valves) and also, with removal of one adapter, an esophageal detector device to test for incorrect endotracheal tube placement.